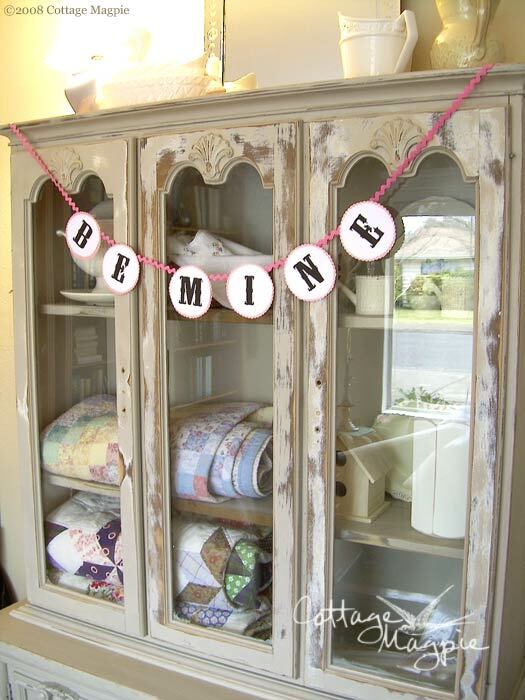 Paper banner garlands look charming everywhere, but this "Be Mine" banner is especially romantic for Valentine's Day draped across my distressed china hutch. To make the banner, simply use the same letters and instructions that I created for the Halloween Boo Garland, but with pink instead of black. If you want to make one, you just need two sheets of pink card stock and two of white, the .ZIP file of letter templates and the instructions from the Halloween garland. Scalloped scissors and ric-rac are optional. Once you've got supplies, it's only about 20 minutes from start to finish. Fun, huh?